Starting in mid-April 2018, Seattle City Light will be partnering with Crown Castle to pilot a project that will support enhanced cellular and data services in the Magnolia area. The project includes the installation of two streetlight poles with LED fixtures near Constance Drive West and West Parkmont Place. One of the poles will be configured with non-functional cellular antenna equipment. Map of the construction work area in Magnolia. Currently, the wireless coverage in the Magnolia neighborhood is insufficient to support the capacity needs of several wireless carriers due to the tough geographic terrain. This pilot project is designed to improve wireless services to the Magnolia area, allowing for better mobile coverage and capacity, improved call quality and fewer dropped calls. The project will also allow for increased public safety and enhanced-911 services to the area. The new LED streetlights will make arterial streets safer by increasing their visibility at night. The fixtures will focus on roadway lighting. Renderings of the Arieta LED streetlight fixture that will be installed. Construction is scheduled to start in mid-April 2018. Daily work hours are from Monday through Friday, 9 a.m. to 3 p.m. The entire project is expected to last approximately two weeks. For more information, customers can contact Chelsea Watson, Crown Castle Government Relations Specialist at (850) 591-4639 or chelsea.watson@crowncastle.com. Visit Seattle City Light’s “At Work in Your Neighborhood” website for the latest updates on this project: http://www.seattle.gov/light/atwork/release.asp?RN=408. Starting in early April 2018, Seattle City Light will be supporting enhanced cellular and data services in the Queen Anne and Westlake areas by attaching two low-power antennas and an equipment cabinet to several utility poles along the public right-of-way. Map of the construction work areas in Queen Anne and Westlake. The project is an expansion of existing communications networks and the new facilities will increase public safety and enhanced-911 capabilities. Construction is anticipated to start in early-to-mid April 2018. Daily work hours are Monday – Friday, from 8:30 a.m. to 4:30 p.m. The entire project is estimated to last up to one month. Customers can contact Matt Clark, Acom Consulting (City Light Consultant) at (503) 250-0863 or matthew.clark@acomconsultinginc.com for questions. 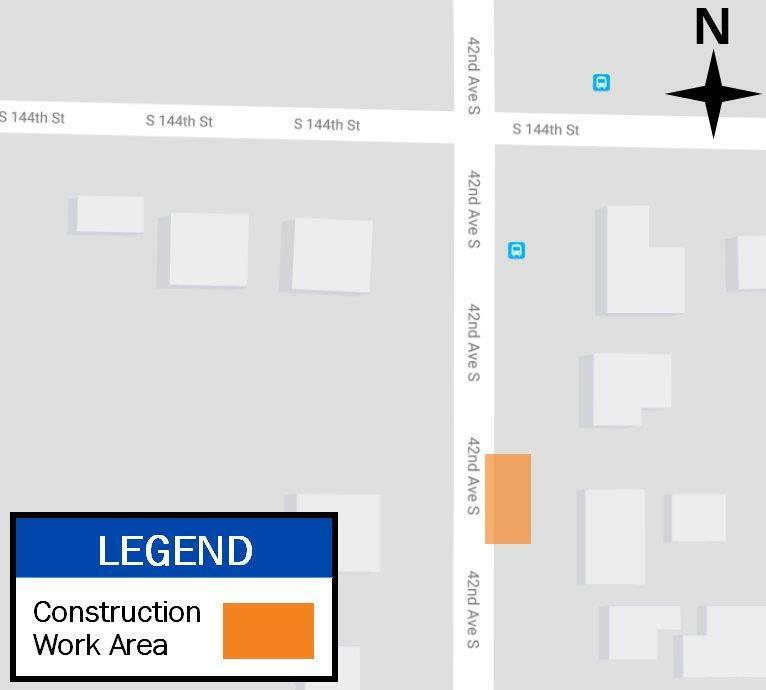 In early February 2018, Seattle City Light crews will be working along 1st Avenue South, between South Royal Brougham Way and Railroad Way South to install a new electrical duct bank. This work is needed to upgrade aging electrical infrastructure in the SODO neighborhood. Stage 1: Crews will begin working in the center two lanes on 1st Avenue South. Traffic will be detoured to the outside lanes going north and south. Stage 2: Crews will then transition to the west side of 1st Avenue South, occupying both southbound lanes for the the duct bank installation. Southbound traffic will merge with the northbound lanes on 1st Avenue South. Parking will be restricted on both sides of 1st Avenue South for truck staging and equipment storage. Work will not occur two hours before and after major Pioneer Square/South of Downtown (SODO) events. Daily work hours are from Mondays through Fridays, 9 a.m. to 3 p.m., and weekends from 9 a.m. to 6 p.m.
For more information, please contact Bill Danbom, Senior Electrical Service Representative at bill.danbom@seattle.gov or (206) 386-1797. Visit Seattle City Light’s “At Work in Your Neighborhood” website for the latest updates on this project and others in your area. Beginning in January 2018, Seattle City Light will be piloting a program to improve customer safety, reduce carbon emissions and conserve resources by installing LED streetlight fixtures in Pioneer Square. Two manufacturers have been selected and customer comments are needed to decide which fixtures will light Pioneer Square. The new fixtures will be evaluated for appearance, historical integrity and light levels. The fixtures must meet City Light standards and Seattle Department of Transportation minimum light level and uniformity guidelines. City Light is testing fixtures on 2nd Avenue South between South Washington and South Jackson streets. The new LED streetlights will make arterial streets safer by increasing their visibility at night. Maintenance power outages are not planned for this work. Customers can expect some traffic impacts during the removal of existing streetlight fixtures and the installation of new LED fixtures. Parking may be impacted within the immediate work area. Starting on February 12, 2018, customers can provide feedback on the pilot LED fixtures through our online survey: surveymonkey.com/r/PSFixtures. Feedback is due by February 26, 2018. If the test fixtures are not approved, they will be scheduled for immediate removal following the board decision. If the fixtures are approved, an order will be placed to convert the Pioneer Square neighborhood to the new fixtures in 2018. Customers can contact Kevin Gorman, Project Manager at (206) 615-0650 or kevin.gorman@seattle.gov. Visit City Light’s “At Work in Your Neighborhood” website for additional information on the pilot project. Contracted crews recently completed their work to replace aging utility poles in parts of Seattle City Light’s south end of the service territory. Crews replaced a total of 274 poles from March 2017 to December 2017. Example of crews working on a utility pole. Utility pole replacements are needed for several reasons. In many cases, poles need to be upgraded to add space for other third-party utilities (such as power, cable TV, phone service, etc.). Poles are also replaced if they are structurally unstable. This can be affected by the age of the pole, weather conditions, wildlife and even vehicle-pole collisions. Completion of this work supports improvements in enhancing electrical reliability for customers. Seattle City Light thanks its customers for their patience during the successful completion of this work. Seattle City Light crews recently completed a project in late December 2017 to replace aging electrical infrastructure in the SODO neighborhood. The work included the replacement of aging utility poles, overhead wire and equipment to help upgrade the existing electrical system. 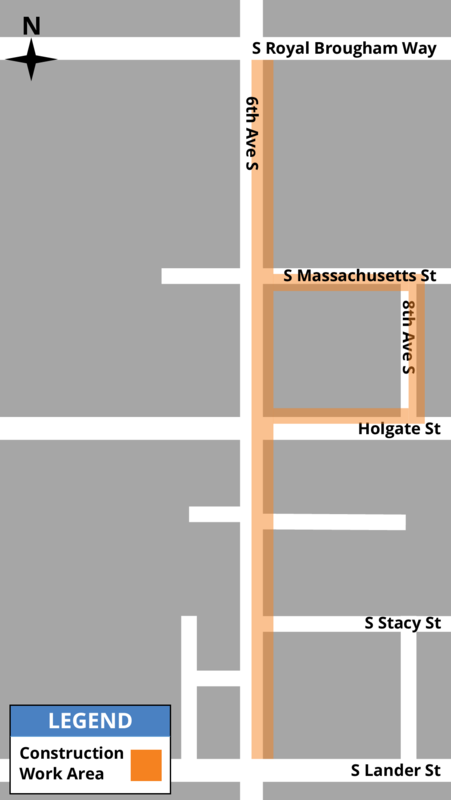 Map of the construction work area in the SODO neighborhood. This work was part of a second phase to upgrade the electrical system in the Chinatown-International District, Yesler Terrace and SODO neighborhoods. Previous work in the Chinatown-International District area was completed in June 2017. Upgrades to these three neighborhoods will support redevelopment projects and increased electrical reliability, flexibility and capacity. Seattle City Light will be hosting a community meeting for Arroyo neighborhood residents on Thursday, December 14 from 6:30 – 7:30 p.m. at the Westside School to discuss an unplanned power outage that took place on December 3. The meeting will also include information about the history of the neighborhood’s electrical infrastructure, and future upgrades for the Arroyo area. Click on the flier for more information. The Westside School is located at 10404 34th Avenue Southwest, in West Seattle’s Arbor Heights neighborhood. Street parking is available around the neighborhood and east of the campus on 32nd Avenue Southwest. The meeting will be held in the school’s theater. For more information, please contact Shelby Calipes, Customer Engineering Supervisor at (206) 386-4274 or shelby.calipes@seattle.gov.